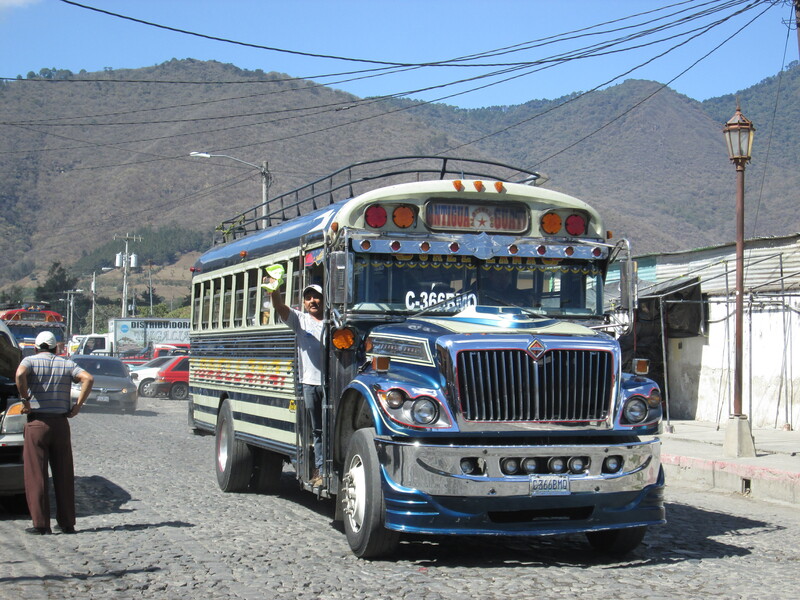 Old American school buses have a second life in Guatemala. They are imported, gussied up according to local taste, and converted into what are lovingly called chicken buses, because presumably the local Maya could transport pigs and chickens as well as themselves. They come with a driver and a conductor, who hangs out the front door as in the photo above, calling out the destination. Anyone could stop one of these second class buses by simply hailing it and climbing aboard. The conductor collects the fare and makes change, sometimes making the passenger wait until more fares are collected. 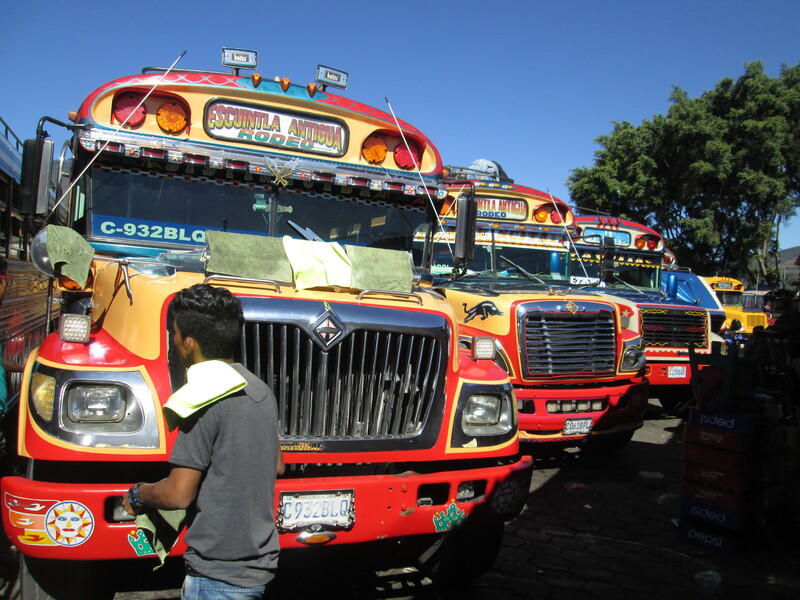 I did not take any chicken buses in Guatemala because of the potential for hold-ups and assorted violence. The guidebooks say to take tourist shuttles instead, even though they cost considerably more. Also, I do believe the language used by the driver and conductor is usually the local dialect of Mayan. There tend to be two, sometimes three, public transit options in the intercity market: chicken buses, tourist shuttles, and the (rare) first class bus that goes from point to point without picking up or discharging passengers on the way. (In a later post, I will tell you about my adventures careening through the jungle in a somewhat ratty first class bus.) 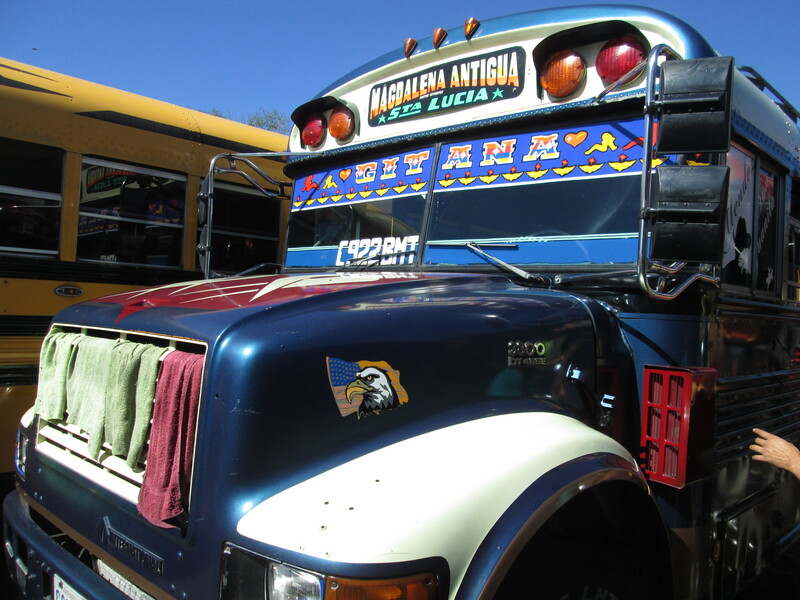 The first class buses are usually for Ladinos; the chicken buses, for the locals; and tourist shuttles for Gringos. All the buses shown on this page were taken in Antigua near the second class bus terminal. The buses in Eastern Guatemala are different. But more about that later. This entry was posted in vacation and tagged antigua, chicken-buses, tourist-shuttles, transportation. Bookmark the permalink.